The long reign of Kansas City political boss Thomas J. Pendergast came to an end in 1939, after an investigation led by Special Agent Rudolph Hartmann of the U.S. Department of the Treasury resulted in Pendergast's conviction for income tax evasion. In 1942, Hartmann's account was submitted to Secretary of the Treasury Henry Morgenthau, Jr., in whose papers it remained for the past fifty-six years unbeknownst to historians. 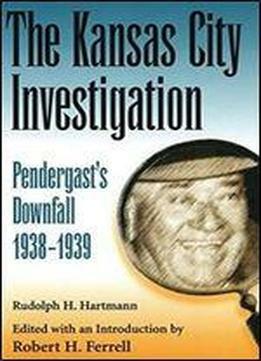 While researching the relations between Pendergast and Franklin D. Roosevelt, Robert H. Ferrell came across Hartmann's landmark reportthe only firsthand account of the investigation that brought down the greatest political machine of its time, possibly one of the greatest in all of American history.Reading like a "whodunit," The Kansas City Investigation traces Pendergast's political career from its beginnings to its end. As one of America's major city bosses, Pendergast was at the height of his influence in 1935-1936 when his power reached not merely to every ward and precinct in Kansas City but also to the statehouse in Jefferson City and Capitol Hill in Washington, D.C. It was during this time that the boss took a massive bribe$315,000from 137 national fire insurance companies operating within Missouri, opening him to attack by his enemies.Early in 1938, an official in the Washington headquarters of the Bureau of Internal Revenue, a former Missourian, quit his job to accept private employment, but not without first tipping off a reporter from the Kansas City Star about Pendergast's bribe. The reporter immediately phoned Lloyd C. Stark, the governor of Missouri and a known enemy of Pendergast. Stark then went to Washington to inform President Roosevelt. Although the president had been a supporter of Pendergast, he now considered Stark a more important political ally. Roosevelt asked the Treasury Department to investigate Pendergast's income taxes. The intelligence unit of the Treasury Department put Hartmann, its best operative, on the case. Within a year, after the most minute of inquiries into checkbooks, serial numbers on currency, a safe-deposit box, and a telegraphed transfer of $10,000, Hartmann and his agents found enough evidence to convict Boss Tom.More than a simple account of what the Roosevelt administration did to cause the collapse of the Pendergast machine, The Kansas City Investigation takes the reader through the ups and downs, twists and turns, of this intriguing investigation, all from an insider's perspective. More important, Hartmann's report provides historians and readers alike the opportunity to evaluate the machine era in American political historyan era that, according to the investigation, "proved the old axiom that truth is stranger than fiction.'"